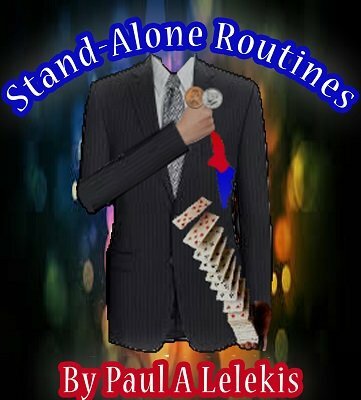 Paul A. Lelekis provides workers with five very strong, full routines that can be used in any performer's repertoire. These routines are strong openers and powerful closers. This e-book begins with a Prologue called Consistency of Action. This section is a "how-to" guide for making your magic more professional - very important stuff. Patter and many photographs are included. There are NO difficult sleights used, allowing you to concentrate on the funny patter. Paul also included a video of The Retention of Vision Coin Pass. 1) ATAVISTIC MATRIX - This is a very visually pleasing assembly that uses only two cover cards and four coins. The vanishes and reappearances of the coins become increasingly more amazing and more impossible for each coin, until all four are found at the "leader" position. Then, one by one, the coins move back to their previous positions in the matrix. This routine has a very nice flow and there are NO "chancy" moves - just magic. 2) THE COLOR CHANGING SILK - A classic of magic that can be played close-up, cabaret or even stage. All patter is included...and it is hilarious. This is a 7-8 minute routine that first "explains" how the trick is performed...but then ends with the spectators knowing even less than when they started. This will get a HUGE response and applause. This routine is a wonderful closer for your act. 3) UNEXPLAINABLE! - This ESP routine is an unfathomable closer. A prediction is within a small change wallet and is placed out on the table for all to see. Next a deck of cards is displayed and thoroughly shuffled. The cards are dealt out, face up, by the performer or the spectator. The spectator may say "Stop!" anywhere she chooses - it really is a free choice. The performer then gives her the option to go on or stay with her first choice - she can change her mind or stay. The very NEXT card is laid on the table, still face down. The prediction exactly matches the face-down card. This effect is truly unexplainable! 4) DOUBLE FLASH CHANGE - This routine has its roots back in the Tarbell Course and is SO STRONG, you will hear audible gasps from the spectators. If you want a truly magical routine...this is it. Two cards are selected and very fairly placed into the middle of the deck. Then the cards are placed into a glass where there is NO possibility of manipulation. A scarf or hanky is placed over the cards in the glass for only a second, and when whisked away, the first selection is seen at the face of the deck. Next, the scarf is only placed in front of the glass for less than a second and then whisked away to show the second selection. 5) BONUS! WILDER COIN is Paul's rendition of the popular David Roth effect. Paul has brought this routine to another level and your spectators will be astonished. Basically, the performer changes four silver coins into four copper coins in a flurry of very visually-appealing revelations. Each coin is changed, one at a time, into a copper coin and then placed into a cup...then when you say the magic word - ALL FOUR COPPER COINS instantly change back into silver coins and you end clean! 1st edition 2014, 22 pages.